The LG K30 X410PM will be available from Sprint, Boost Mobile and Virgin Mobile. 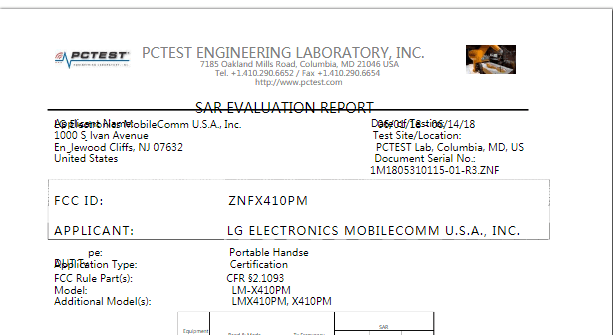 Another variant of the LG K30 with the model number “X410PM/LMX410PM” has recently been spotted going through the FCC for certification. According to our sources, The LG X410PM is a variant of the LG K30 coming to Sprint. Maybe the carrier will release the X410PM under a different name. Like many other LG K30 variants, The X410PM comes with Android N 7.0 OS out the of the box. The phone with the model number X410TK is currently available from T-mobile. The x410 is equipped with a 1.4GHz quad-core Qualcomm Snapdragon processor, 2GB RAM, and 32GB expandable storage. It features a 5.3-inch display with 720p resolution, a 13-megapixel rear-facing camera, and a 5-megapixel front camera. To learn more about Sprint LG K30 X410PM specs and features, please have a look at T-mobile K30 x410tk page on LG official website for reference.